Sewn Frame Photo Album 7"X9" 200 Pockets - PIONEER-Sewn Frame Photo Album. Keep your favorite photos in this easy to display photo album! Album has an opening for a 5-1/4x3- 1/4 inch photo, and has page protectors that can hold two 4x6 inch photos. 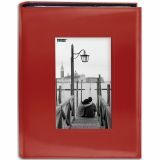 This package contains one 7x9 inch photo album and enough page protectors to hold 200 photos. Available in a variety of colors, each sold separately. Archival and photo safe, acid and lignin free. Imported.